Five living species make up the Rhinocerotidae family. 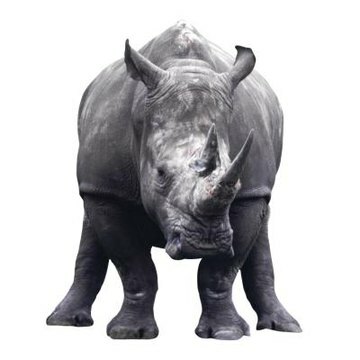 Black rhinos (Diceros bicornis) and white rhinos (Ceratotherium simum) live in sub-Saharan Africa. The other three species live in Asia: Sumatran rhinos (Dicerorhinus sumatrensis), Javan rhinos (Rhinoceros sondaicus) and Indian rhinos (Rhinoceros unicornis). Although adult rhinos have no natural predators, all of these species are endangered. Poachers kill hundreds of rhinos each year solely for their horns, which are valued ingredients in many Asian folk remedies. All rhinos eat plant matter exclusively, and their lips and teeth are adapted to taking and breaking down vegetation. White rhinos are known as grazing rhinos, with wide, square lips suitable for eating grass. Other rhinos do more browsing and foraging with the help of prehensile upper lips. They use these lips much like fingers, grasping branches and twigs. Asian rhinos differ from African rhinos in that their lower incisors grow into strong tusks. Asian rhinos use these tusks as weapons, slashing opponents in fights. In male Indian rhinos, for example, these tusks can grow more than 3 inches long—capable of inflicting deep, life-threatening wounds. Growing up to 6 feet tall and weighing as much as 8,000 pounds, rhinos are among the largest mammals walking the Earth—only elephants are larger. White rhinos are the largest species, while Asian rhinos tend to be smaller. With their broad chests and heavy hoofed feet they trample through forests, crushing underbrush and leaving broad paths cleared behind them. Although both sexes reach a similar size, males tend to be slightly larger. Still, as large as they are, modern rhinos look small in comparison to their ancient ancestor the Indricotherium, which stood over 18 feet tall and weighed 66,000 pounds. Rhinos usually have gray skin, although their individual shade depends to some extent on the soil conditions where they live and graze. Their skin is wrinkled and almost entirely devoid of hair. The skin on certain parts of their bodies, especially their shoulders, can be as much as 1.5 inches thick. Beneath their skin, a one- to two-inch thick layer of fat helps the animals regulate body temperature. In some species, such as the rare Javan rhino, the skin grows in deep, regular folds that make them look as though they are wearing plates of armor. Rhinos' horns are perhaps their most famous physical feature—even the name "rhinoceros" comes from Greek words meaning "nose horn." Both African species have two horns, with the one toward the end of the nose being the largest and most prominent. Of the Asian species, Sumatran rhinos also have two horns. Individuals of the other two Asian species have only one horn. These horns aren't bone; they're actually composed of keratin, the same material as fingernails. Although no scientific proof exists that rhino horns have any medicinal value, they are used in Asian folk medicine to cure a wide range of maladies, causing poachers to kill hundreds of rhinos each year. What Do the Rhinos Eat Normally?